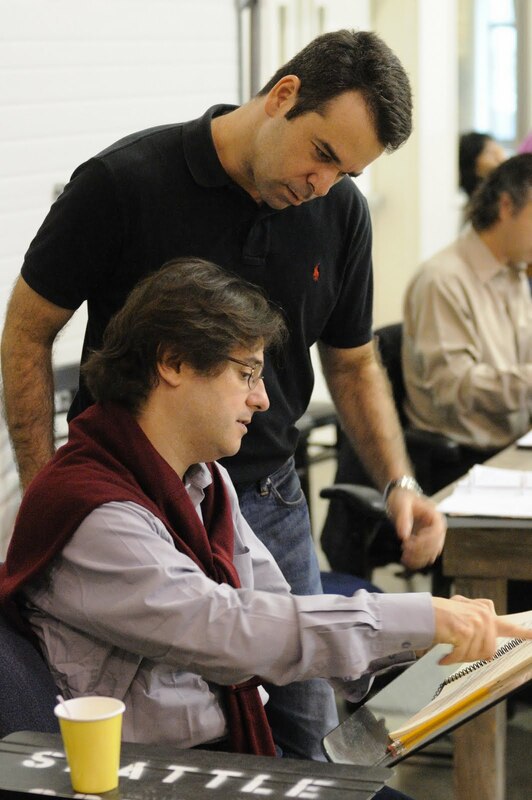 I stopped by rehearsal the other day to check in with our wonderful maestro, Bruno Cinquegrani, who is making his Seattle Opera debut with this production of Lucia di Lammermoor. As I write, he has only been with us a week, and already his overflowing love for this music has been an inspiration to cast and crew. 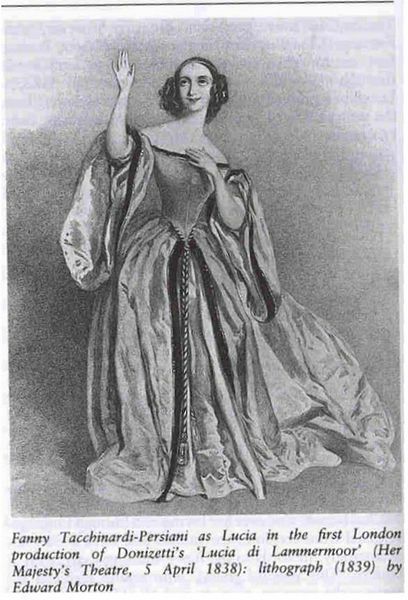 Maestro, you grew up in Naples, where Lucia had its world premiere performance in 1835. And, before coming to Seattle, you conducted the season opening concert for the symphony there. 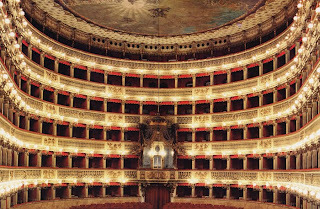 Tell us more about your relationship with that august institution, the Teatro San Carlo. When I was growing up, we had two important institutions in Naples, the Teatro San Carlo (which I attended as a student, whenever I could) and the orchestra of our national radio, RAI Italia. My piano teacher was connected there, so I went very often to observe rehearsals when I was a kid. RAI had four major radio orchestras back then (Naples, Milan, Rome, and Turin), these were great orchestras, they used to get invited to Salzburg, but there was a rapid decline and three of them closed. That’s about the time that I left Italy; I was 22, I had finished my degrees in piano and in composition, and I went to Germany to continue studying. And conducting at Teatro San Carlo a few weeks ago? I was originally going to do a La bohème there a couple of years ago, but it got canceled because there were budget problems. And they were very kind, they asked me to lead these concerts this September instead; we did Beethoven’s 7th, Stravinsky’s Pulcinella, and the overture to Offenbach’s Orpheus in the Underworld. It was amazing, coming home after all these years, I was like the prodigal son! It was a bit like a wedding--the audience was packed with family and friends. And it was fantastic to work with that extremely talented orchestra. Did you say you had a degree in composition? Yes, but that was when I was younger, before I moved to Germany to study conducting. With some friends in Naples we had a small chamber group, instrumentalists and singers. We did some original pieces and also a sort-of ‘history of music’ program, which we had researched very carefully over the course of a year. There’s so much fascinating music history that happened right there in Naples. And it’s still happening; Teatro San Carlo just did a premiere, they were rehearsing it when I was there just now. You’re becoming known as something of a Donizetti specialist. What is it that you like about Donizetti? Oh, oh, oh…can I humbly suggest that I’m not really a specialist? Or at least, maybe I should put it this way, I’d like to think that I can be accurate, if that’s what it means to be a specialist, in every kind of music I conduct. That everything I do is deeply studied, deeply thought, deeply felt. But you’ve conducted lots of Donizetti. I’ve conducted Lucia di Lammermoor twice before this; also L’elisir d’amore and Don Pasquale, among his comedies, and Lucrezia Borgia and Marino Faliero, serious operas, for the Donizetti Foundation in the composer’s hometown of Bergamo. And then they asked me to conduct La traviata for their recent tour in Japan--that’s not Donizetti! Marino Faliero is one of those Donizetti operas that never gets performed in the US. Maybe, but it’s a fantastic opera. We performed this brand-new reconstructed edition, the cd and dvd should be out soon, on Naxos. It’s interesting, it came out of a competition that Rossini sponsored at the Thêatre des Italiens in Paris, in 1834. 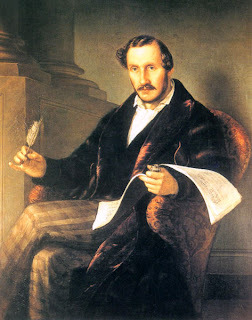 He invited both Bellini and Donizetti, duelling rivals, to write an opera for Paris; they wrote these two difficult pieces for the great singers of the day, Donizetti wrote Marino Faliero, and Bellini wrote I puritani and then died. And I puritani won the duel! But to answer your question, what I love about Donizetti is, the bel canto in these operas is not there for the sake of bel canto alone. The music is always connected with the action. Of course there’s a beautiful line, but the music is very much linked to the words. Donizetti is the true bridge between Mozart and Rossini, classical composers, and Verdi. We were working on the Lucia sextet, earlier today, [goes to the piano to demonstrate], and in the fast section, listen, it’s Verdi’s Nabucco. 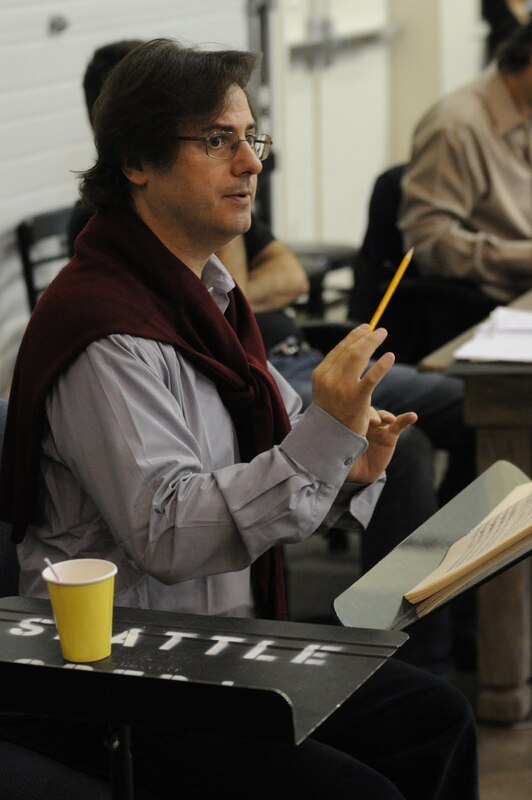 Seattle Opera Head of Coach Accompanists David McDade was telling us recently about studying Donizetti’s manuscript score, to catch errors in printed versions and get the composer’s true intentions. How did you prepare the edition we’re using? Yes, it’s something of a problem, because there are lots of editions of the score of this opera and they are all different. Really, my process is to go through all of them, study the differences and the options, and then choose what I feel is appropriate for the drama. The edition I want to perform. If you have someone else’s Lucia di Lammermoor strongly in your ears, you may hear lots of little changes in our version. Does that include cadenzas and vocal ornamentation? We’re using [for the mad scene] the big cadenza that Maria Callas sang, which was written long after Donizetti--he wrote a much smaller cadenza for the first Lucia, Fanny Tacchinardi-Persiani. But the longer version became such a hit, when it was added, that now the public is expecting it. Your career has taken you from Naples to Germany, Yalta [where Cinquegrani conducted the Crimean State Orchestra for two seasons], Aspen, Tokyo, and now Seattle. Are you always an ambassador for Italian music when you work in these far-flung places? No...I don’t really believe in national schools. There are musicians. If you can feel, you can make music. With opera, it can be easier if you grew up speaking the language, but if you’re you’re going to have a job in opera, well, negotiating that is part of your package. The audiences can be different. In Aspen, I found the audiences had this tremendous energy, but that may be because there were so many music students there. When you conduct Italian opera in Italy, they can be much less forgiving--everybody already knows everything about it. If the tradition says, “The tenor must sing a high note here,” and you change that, they’ll let you know they’re unhappy with you. Opera is such an important part of our culture, you know; at the time of Donizetti it was this unifying force, which made Italy one nation from many separate states. And today, we export it. What do you think of Seattle so far? To tell the truth, I’ve been in rehearsal so much I haven’t seen that much of it. It was so nice on Saturday, I walked along the waterfront. My first impression is that it’s a calm city, but there’s lots of energy. It isn’t a crazy energy, like London, where I live, but it’s serious energy. I understand when they say Seattle is one of the most liveable cities. Rehearsal photos by Bill Mohn. Thanks, Jon (& Maestro C)!! for such an interesting and informative interview. I, for one, did not know there were multitudinous "editions" of the "Lucia" score. Schwerin, where I live will be doing a new production of it (Premiere in November), and IO wonder which version will be used here (I must ask the Musikdramaturgin for who I do English versions of the plots for some of the works here). I only wish Maestro C would be in the pit (called "Wanne" ((= Bathtub)) in German houses); from the interview, I'm sure he'll bring verve to the Seattle "Lucia"; a tenor friend who sang the Edgardo under the Schwerin conductor at the Komische Oper Berlin said the latter's conducting was "so very German" (this for a very Italian opera)!! So, toi,toi, toi for Seattle's "Lucia"!!!!!!!!!!! I apologize for some of the grammatical deficiencies in my above "Comment"; i.e., "for who" instead of the correct "for whom"; missing comma after "Schwerin, where I live," "IO" instead of "I" (that was not an intentional slip into the Italian "io" for "I"!). Thus, I am grateful all my English teachers/professors (in the 40s & 50s) are thus long-since dead, or several grades would have been changed in my transcript!!! !